I received 2 bottles of Puritan’s Pride Gummie Vitamins in exchange for this post. All opinions are my own. When you have a picky eater, you are always worried if they are getting the right vitamins and minerals they need, since they won’t touch a vegetable with a ten-foot pole. My eldest daughter is particularly picky and I’ve always struggled with getting her to even take vitamins to help supplement. One thing she does like, no surprise, is gummy candy. So, I had a great idea to try gummy vitamins. Puritan’s Pride takes all the essential multi-vitamins you need and packs them into a delicious gummy. These multivitamins gummies may taste like candy, but rest assured that they’re packed with essential vitamins and minerals necessary for your child’s healthy growth and development. Included are Vitamin A for the eyes, Vitamin D for the bones, and Vitamins C and E, plus Zinc, for the immune system. 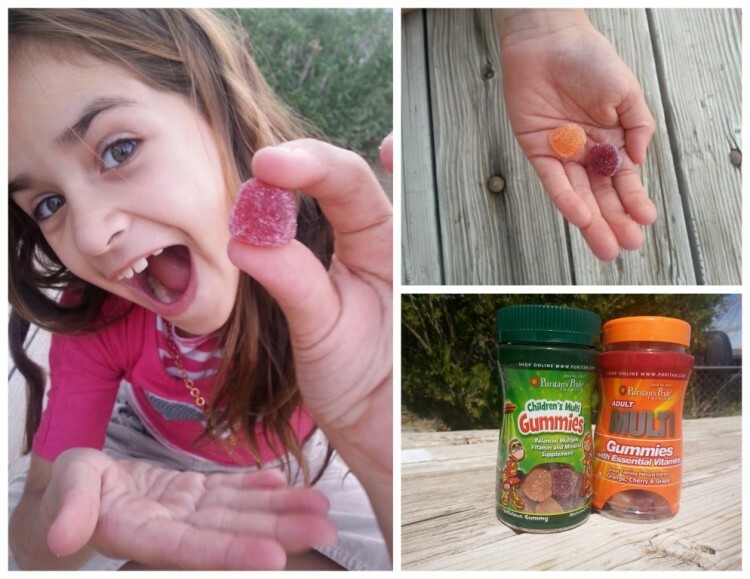 These delicious chewable gummies will make vitamin time your child’s favorite time! My girl’s loved the way Puritan’s Pride Children’s Multi Gummies tasted. They were surprised that they were actually vitamins. It’s been super easy to get them to take them, they remind me! The Adult Multi Gummies also tasted great. They don’t have a medicine or “vitaminy” after taste that you sometimes get with a multi vitamin. It’s a yummy way to get the vitamins you need. Get all your Gummie Vitamins from Puritan’s Pride here. Puritan’s Pride began over 40 years ago, with the mission of making the finest quality nutritional supplements available at the best value to their customers. Today, the company remains true to its original commitment and serves millions of loyal customers. Puritan’s Pride manufactures thousands of vitamins, minerals, herbs and other nutritional supplements in their state-of-the art facilities located throughout the U.S. As part of the company’s commitment to quality, Puritan’s Pride only uses ingredients from suppliers worldwide that meet their Quality Assurance Standards, as well as Good Manufacturing Practices food quality standards.